Back of Ticket - Spaces for "Name", "Address", and "Phone No"
Whether they're getting ready to win or ready to enter your big event, your guests will love the thrill of entering with this blue 2-part raffle ticket. Two parts means you get to keep the ticket while they keep the coupon – there's no memorizing of entry numbers with this 2-part raffle ticket, the number of the ticket remains with your patrons as long as the ticket does! 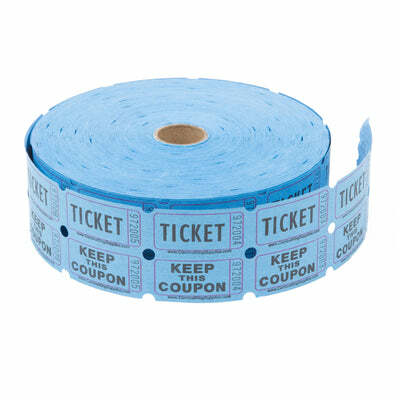 Plus, with a blue color, this ticket isn't going to get lost any time soon.